The latest virtual reality (VR) technology is playing a key part in workplace health and safety training. A solution from Beca has been adopted at Fonterra, which allows employees to navigate manufacturing and distribution sites without having to actually physically be on site. Fonterra Director of Health and Safety, Resilience and Risk Greg Lazzaro said VR has the potential to be a game changer at the cooperative. The VR system uses reality capture techniques to create a realistic point-to-point ‘walkthrough’, which is completed in a VR environment. Trainees are able to move through the scenario between predetermined locations. At each location in the VR training walk, the trainees have the ability to look around to familiarise themselves with their environment. Participating trainees are asked to identify features of importance and perform various ‘interactions’ that have been overlaid on the scenes. The interactions are focused on training and assessing their understanding in four key areas: health and safety, food safety and quality, asset management and sustainability. Using VR provides a safer learning environment, creating strong familiarisation of worksites for the workers. “While our health and safety performance continues to improve we are always looking for ways to reduce risk to our employees. Using VR means our people can experience virtual hazards, enhancing learning experiences, without being put in harm’s way,” said Lazzaro. The new VR technology will replace practical health and safety training at Fonterra following a successful pilot. Training can be tailored to each of Fonterra’s sites and tested through the completion of modules. 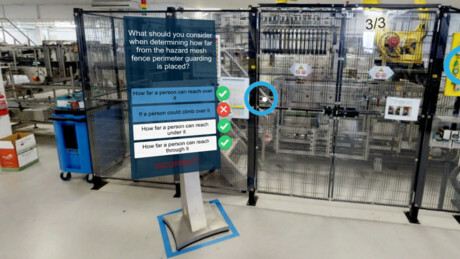 Andrew Cowie, Project Manager for Beca, said the technology is the future of health and safety training and can be easily replicated in other workplaces and training areas. “Walmart now trains using VR, American footballers are using it and so is the military. Our clients are increasingly interested in the application of VR technologies and the value it can add to their businesses,” he said.